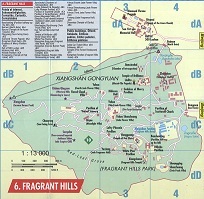 This Overview Map gives a clear overview of the Area of the Summer Palace (YiHeYuan), Old Summer Palace Ruins Park (Yuanmingyuan), Yuquan Shan, Fragrant Hills Park and Beijing Botanical Gardens in the North-West of Haidian District of Beijing. Clearly visible are the Beijing Botanical Garden grounds with the Temple of the Recling Buddha, separated from the Summer Palace by the 5Th Ring Road and Yuquan Shan, the Jade Spring Mountain which is a military administrated zone. In the West bordering on Mentougou District stands the Temple of the Azure Clouds (Biyun Si), together with the famous 'Fragrant Hills Hotel' (or Villa)(Xiang Shan Fang Dian) - Mao Zedong's 1st Governement Retreat in Beijing- part of the much larger Fragrant Hills (public) Park. The highest peak in Fragrant Hills Park is the incense burning peak. Browse the map to choose your subway station for easy travel to- and from the Summer Palace and the other more remote locations. Travel beyond the Yuanmingyuan and Yiheyuan Parks is by Bus or Taxi only. 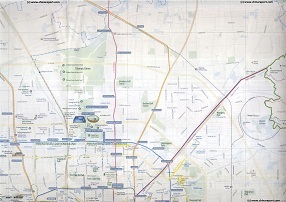 Check Subway Map for exact connections, or read the chapter on Beijing Public Transport, or Reports on each location and landmark for travel information. Flow the links where available to find photo's and more information on each Landmark, Monument and location. Includes all Pavilions and Sites within Fragrant Hills Park of Beijing, located in the Western Hills of North-West Haidian District.